There are occasions when the planets are aligned quite correctly (or something) and you realise that you are in one of those ‘moments’ that lasting memories are made of. I recently found myself in one of those moments. It’s the annual Phillipe Orban Sensei (6th Dan Aikikai) seminar, which has becomesomething of a regular, though certainly not mundane or commonplace, affair, brought to us from Leipzig, Germany, by Fillip Maric (4th Dan Aikikai). This year however, has proven to be something special. 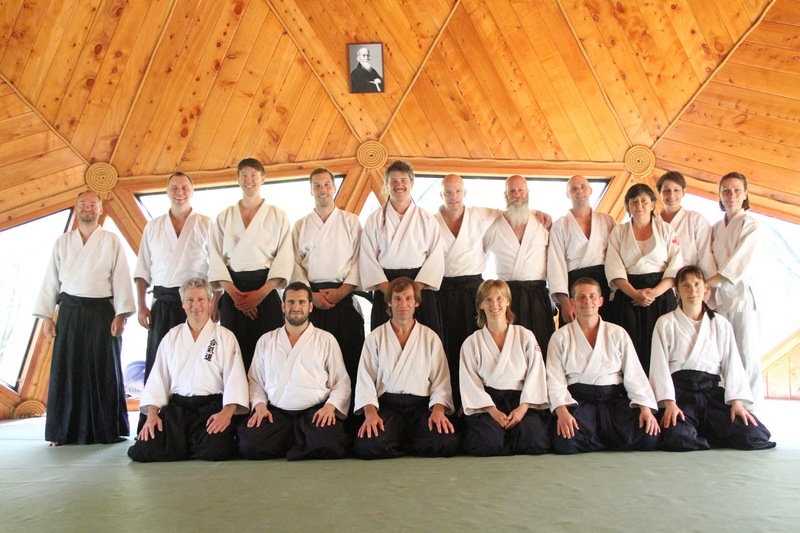 Phillipe has brought with him a small retinue of his students from various German dojos and, consequently, a select event, hosted by David and Hisae Lynch at the Koru Dojo, Coromandel, was on the cards. The 4 day end of winter camp was a ‘live in’ style affair that found us camped out on the floor of the awe inspiring Koru dojo ‘dome’. 6 Kiwis and 12 Germans in all – not including our hosts of course. This was by no means the stark ascetic life of the ‘live in uchi deshi’ for we are all a little too soft for such things (or at least I am), but it was at least a glimpse into that world and did include somewhere in the region of 6 or so hours of training a day. Sore? You betcha. I won’t spend too much time on the Kashima classes as there is a limited select audience for this currently, but we spent the morning session concentrating on the basic sword movements and cuts that are quintessential foundational exercises for Kashima, and the evening session on the practical application of the exercises by working through the First Series of kata – Kihon Dachi. To Aikido then. As I said, the aikido sessions built on previous work and insights by Phillipe that he discussed briefly at the Auckland seminar. In a nutshell – extension vs tension, flexibility vs relaxation, integration vs separation, unity vs disparity. As Phillipe acknowledges, he no longer ‘teaches’ tai sabaki at his dojos. Why? Because perhaps the tai sabaki arises as a result of correct body movement, rather than the opposite assumption that tai sabaki ‘creates’ proper body movement. Or so goes my interpretation anyway. Our sessions therefore involved little to no actual ‘training’ in techniques – which is not to say that there were no techniques in use. Jiyu waza was a part of almost all sessions at some point or other. No, the main focus of these sessions was to lay the proper foundations for good movement and from such movements allow Aikido to arise. Sound familiar? You might want to check out some of O’ Sensei’s writings on the subject matter for comparison! And again, the level of concentration and intensity required to begin this process really sets your teeth grinding. By the end of each session, you really know you have been busy and parts of your body you never knew existed suddenly start complaining – regularly. 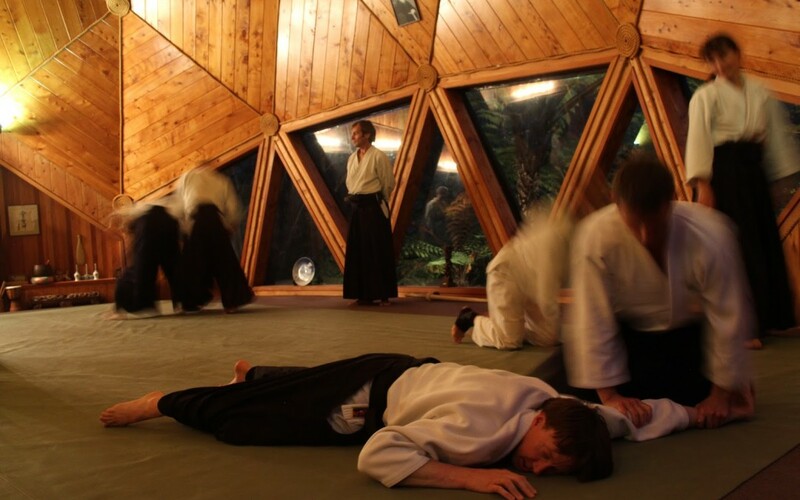 It was, and is, a refreshing way to study and train in Aikido and to a certain extent it seems to work better at ‘building the picture’ of Aikido than what we perhaps refer to as ‘traditional’ methods of teaching. I have to say that all of this is built up and cemented into your psyche by Phillipes constant verbal and physical refinement and explanation as to the process he is involving you in. It has, as he says, a process, a means to something – not perhaps an end – but rather a way – a do! But enough about the sessions, for I am still not sure where to begin or end with my own understanding of the camp – as I said to Phillipe at the end of the camp, I feel like a sponge – saturated by martial experience, and I am sure that it will slowly ferment over the coming months (years) until it eventually makes some internal sense for outward application. On the last day, David Lynch joined us in his dojo for a quick lesson on the finer points of Aikido that he has gleaned over the years. What an amazing end to the camp. My thanks in particular go to David for a fantastic afternoon I got to spend in his company, over tea, chatting about his life and experiences in the Aikido world and beyond. It’s a rare thing to spend time with such an influential and distinguished elder statesman of Aikido in a private setting, a joy which he did not have to give, but did so because as those who have met him will probably attest – thats just who he is! David is certainly a true gentleman. And that perhaps is only the beginning. The whole experience will settle into my life as one of those ‘great stories’ that will grow older and more distinguished with age, like a fine whisky. 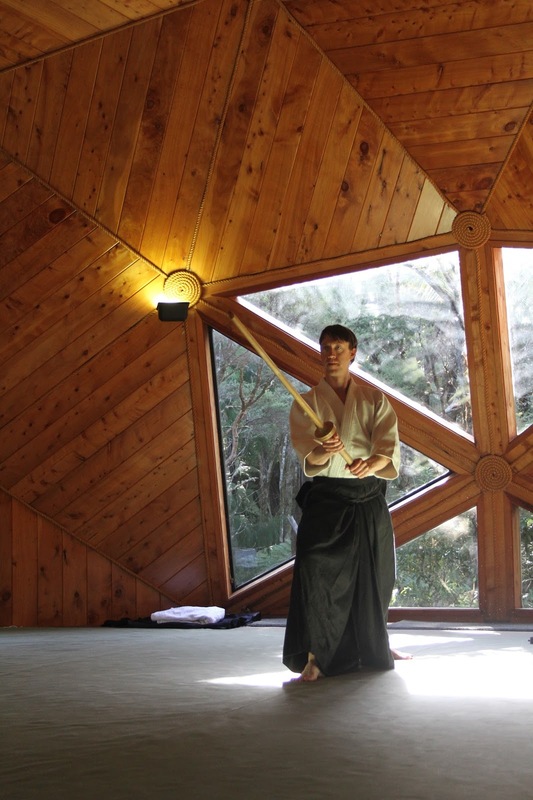 The Koru dojo itself is a fantastic space of soaring timber and rope that really does take the breath away, set in David and Hisae’s extensive private bush property near Whitianga with such delights as a riverside galaxy of glowworms, more than one waterfall and pool, tracks through the bush, a resident kiwi, some apparently scary possums, the odd hedgehog, and of course the star attraction – Neil (or Nelly) the Eel! So, 84 hours, a few hundred kilometers of coromandel roads (gravel included), some bruises (thanks Liam! ), some new experiences, a bunch of crazy but humorous and dedicated Germans, some slightly bonkers Kiwis (and other migrants) and our genteel hosts David and Hisae lynch. As Filip Maric rightly put it at the close of business – ‘PERFECT’.